Meet Sherbert, a 10-week-old domestic-short-hair cat. The volunteers say that he loves being held and is very playful. Sherbert has received his FVRCPC vaccination and has been de-wormed, flea treated, neutered and micro-chipped. If interested in giving him a new-loving home, please call 740-335-8126. There are several animals in shelters that are waiting for their forever home, please consider adopting rather than shopping for a new friend. The Fayette Humane Society is also in need of scoopable cat litter, dry Purina kitten chow and canned cat food. Donated items may be dropped off at the downtown adoption and business center located at 153 S. Main St., Suite 3 in Washington C.H. Donors may enter in the doors on the East Street side. Additionally, the Fayette Humane Society is encouraging residents to register online for the Sept. 10 Walk Against Animal Cruelty at www.fayettehumanesociety.com. 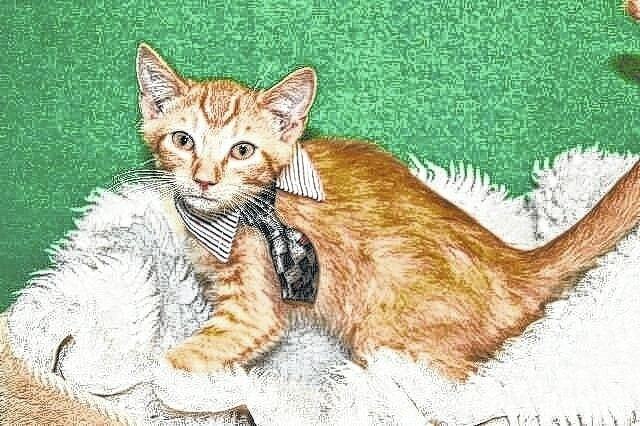 https://www.recordherald.com/wp-content/uploads/sites/27/2016/08/web1_PetoftheweekSherbertRedo.jpgMeet Sherbert, a 10-week-old domestic-short-hair cat. The volunteers say that he loves being held and is very playful. Sherbert has received his FVRCPC vaccination and has been de-wormed, flea treated, neutered and micro-chipped. If interested in giving him a new-loving home, please call 740-335-8126. There are several animals in shelters that are waiting for their forever home, please consider adopting rather than shopping for a new friend. The Fayette Humane Society is also in need of scoopable cat litter, dry Purina kitten chow and canned cat food. Donated items may be dropped off at the downtown adoption and business center located at 153 S. Main St., Suite 3 in Washington C.H. Donors may enter in the doors on the East Street side. Additionally, the Fayette Humane Society is encouraging residents to register online for the Sept. 10 Walk Against Animal Cruelty at www.fayettehumanesociety.com.